202 pages | 20 B/W Illus. After 1945 it was not just Europe’s parliamentary buildings that promised to house democracy: hotels in Turkey and Dutch shopping malls proposed new democratic attitudes and feelings. Housing programs in the United Kingdom, the United States, and the Soviet Union were designed with the aim of creating new social relations among citizens and thus better, more equal societies. Architecture, Democracy, and Emotions focuses on these competing promises of consumer democracy, welfare democracy, and socialist democracy. Spanning from Turkey across Eastern and Western Europe to the United States, the chapters investigate the emotional politics of housing and representation during the height of the Cold War, as well as its aftermath post-1989. The book assembles detailed research on how the claims and aspirations of being "democratic" influenced the affects of architecture, and how these claims politicized space. Architecture, Democracy, and Emotions contributes to the study of Europe’s "democratic age" beyond Cold War divisions without diminishing political differences. 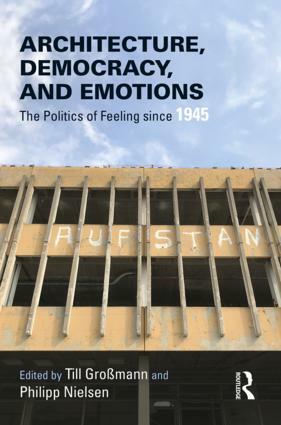 The combination of an emotional history of democracy with an architectural history of emotions distinguishes the book’s approach from other recent investigations into the interconnection of mind, body, and space. Till Großmann specializes in the modern social and political history of Germany. He is a PhD candidate at Freie Universität Berlin and a member of the International Max Planck Research School—Moral Economies of Modern Societies, Berlin. His dissertation project on love, marriage, and partnership in state-socialist East Germany reflects his research interests in the history of emotions, gender, and subjectivity. Philipp Nielsen is an Assistant Professor for Modern European History at Sarah Lawrence College and Associated Researcher at the Max Planck Institute for Human Development in Berlin. He received his PhD from Yale University. His research interests include Jewish German history, German political and architectural history, and the history of emotions.